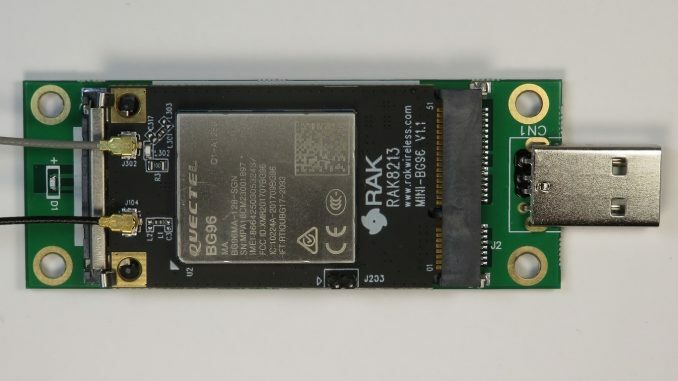 The RakWireless RAK8213 is a Quectel BG96 based 4G LTE Cat M1/Cat NB1/EGPRS modem in a PCI Express MiniCard Form Factor. LTE categories M1/NB1 combined with innovations including Power Saving Mode (PSM) and Extended Discontinuous Reception (eDRX) can rival power consumption and battery life of other IoT Technologies such as LoRa and Sigfox. The RAK8213 is available from Aliexpress for just $39.90 USD. The BG96 includes an integrated TCP/IP stack with HTTP and MQTT client, greatly simplifying firmware development. LTE Cat M1, Cat NB1 (NB-IoT) and EGPRS. GNSS – Support for GPS, GLONASS, BeiDou/Compass, Galileo and QZSS. USB 2.0, UART & PCM Interface. Integrated TCP/IP stack with support for SSL, HTTP & MQTT. Text and PDU Mode SMS. Supply Voltage range of 3.3 to 4.3V. Recommended typical supply voltage 3.8V. LTE Cat M1 and NB1 are ‘bolt-on’ Cellular LTE (4G) protocols designed for low power consumption IoT (Internet of Things) devices. Both M1 & NB1 are part of the 3GPP Release 13 standard. By reducing the complexity of the radio, Cat M1/NB1 devices can also be manufactured at a lower cost than today’s 3G and LTE modules, accelerating the deployment of LTE IoT. and with a typical latency of 10-15mS. Half-duplex consumes less power as both the transmitter and receiver are not operating at the same time. Many devices (such as the BG96) and network operators only offer Half-Duplex Cat M1 operation. Cat M1 can use existing LTE spectrum in-band and provide seamless hand-over between base terminal stations (BTS), just like conventional 4G LTE mobiles. It is ideal for telemetry applications and can support VoLTE (Voice over LTE) opening up applications in aged care, independent living and security. Cat NB1 – (Narrow Band) also known as NB-IoT goes one step further, requiring just 180 kHz of spectrum. It can achieve a 250kbits/s symmetrical half duplex uplink and downlink with a 1.6s to 10s latency. Unlike other LTE protocols, NB1 does not support handover between BTS, and is limited to fixed IoT applications. NB1 uses a different modulation scheme and hence does not operate in conventional LTE spectrum – It requires it’s own 200 kHz spectrum, and is often deployed in side bands or spectrum freed up from GSM Networks. For operators of existing LTE mobile networks, the advantage of Cat M1 and NB1 is that in the majority of cases the roll-out is just a software update. Cat M1 is easier to deploy as it uses existing LTE spectrum. When idle, your LTE mobile phone will remain in what is called RRC (Radio Resource Control) Idle Mode. This mode uses Discontinuous Reception (DRX), also commonly known as paging, to enhance battery life. Your LTE mobile phone will wake up every 1280mS to check if it has incoming calls, SMS messages etc. Extended Discontinuous Reception (eDRX), as the name suggests, extends the paging cycle out reducing the time the radio is listening and hence power consumption. PSM allows the module to power down, but remain registered on the Network, mitigating the need to re-attach or re-establish Packet Data Network (PDN) connections. The BG96 can tell the network it is going dormant and enter a low power mode (10uA). It will sit in this mode until an external device wakes up the module or a timer expires. PSM can be enabled via the AT+CPSMS command. Once dormant, the BG96 can be woken up by driving the PWRKEY pin to a low level. Telstra is currently the network of choice for IoT development in Australia as it has published detailed information on supported frequency bands complete with IoT coverage maps. Telstra uses band 28 (700MHz). At the time of writing, the other Australian carriers have limited to no public information on their Cat M1 and Cat NB1 rollouts. In addition to having a RCM (Regulatory Compliance Mark) for use in Australia, the Quectel BG96 module is certified for use on the Telstra Network. Probably the cheapest way to get on the Telstra Cat M1 network is via virtual mobile network (MVNO) operator Aldi. Aldi offer a prepaid SIM card for $5 that includes $5 of pay-as-you-go credit on a 365 day expiry. It would appear MVNOs such as Aldi do not get access to the Telstra Cat NB1 network. Update January 2019 – Vodafone Australia is operating a Cat-NB1 network on band 8 (900MHz). A prepaid Vodafone $2 SIM will gain you access to this network and a $10 ‘365 Plus‘ recharge will get you 365 days access to the NB1 network at $0.02 per MB data. Hologram, based in Chicago Illinois offers Global cellular connectivity for IoT devices. With one SIM card, you can deploy your IoT device in over 170 countries and on 396 carriers. Pricing varies based on the number of devices you deploy. Hologram Professional Edition offers access at $1 USD/month and 40c per MB for 1 to 99 devices. Maker Edition provides cheaper monthly access at just $0.60 USD/month and 40c per MB for a maximum of 25 devices. Hologram offer a single free ‘Pilot’ SIM providing the developer with monthly access and 1MB/month of data for free. I signed up for a free SIM card. Despite having carrier agreements with Vodafone, Singtel Optus and Telstra, I was unable to get registration. Update January 2019 – Hologram is now working on the Telstra Cat M1 Network (the only Cat M1 Network I can see). Registration is denied on the Telstra Cat NB1 and Vodafone Cat NB1 Networks. According to Hologram, the roaming scenario for Cat-M1/NB-IoT isn’t fully standardised. Hologram have few confirmed Cat-M1/NB-IoT networks around the world, and currently none in Australia. The Hologram SIM will, however, work on the 3G and 2G networks. While the BG96 supports EGPRS (2.5G), all the carriers have shutdown the 2G network in Australia. Telstra was the first to shut their 2G network, with the closure on the 1st December 2016. Optus shutdown their 2G network on the 1st August 2017 and Vodafone Hutchison Australia (VHA) more recently on the 30th April 2018. The RAK8213 MiniCard offers a USB2.0 interface, 3.3V UART, PCM, (U)SIM Interface and status I/O. While the BG96 module operates directly from 3.3V, most of the I/O is 1.8V. As such the bottom side of the module includes level shifters to convert the 1.8V I/0 to 3.3V logic levels. Documentation is a little light in regards to antenna connections and LED functions. RakWireless provides a schematic which helps fill in the blanks. J104 is the connector for the Main LTE Antenna. J302 provides connection for the GNSS Antenna. The schematics show it can provide power for active antennas. The USB AT Port is a virtual COM port used to configure the modem (i.e. send AT commands) and is the most useful. The DM port is used for Diagnostics and Firmware Upgrades while the NMEA (National Marine Electronics Association) port provides the output of the GNSS (NMEA messages). My intention is to eventually use the RAK8213 with an embedded micro-controller, hence I wired up the UART port to test. 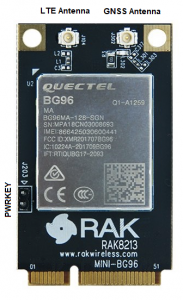 The BG96 module provides three UARTs, but RAK Wireless only broke out UART1 on the mPCI Card. Missing UART 2 and UART3 are used for debugging and GNSS data respectively and is not a significant omission. GNSS location can be requested via AT commands on UART1. The default baud rate for UART1 is 115,200. One of the more significant features of the BG96 is the in-built TCP/IP stack. This eliminates the need for the interfacing micro-controller to have to have a TCP/IP stack, support PPP, HTTP and SSL. Your IoT device can send (POST) and retrieve (GET) data using simple HTTP transactions. The RAK8213 turns out to be a cheap way to get on the Cat M1/NB1 network. Further testing on power consumption is needed. I see that this module does not support MQTT when connecting to an NB-IoT network, is that right ?